In this chapter I will develop and defend an account of one particular scientific virtue, one not easily identifiable among traditional lists of the epistemic or the moral virtues, though components or preconditions of this virtue are found in most such accounts. 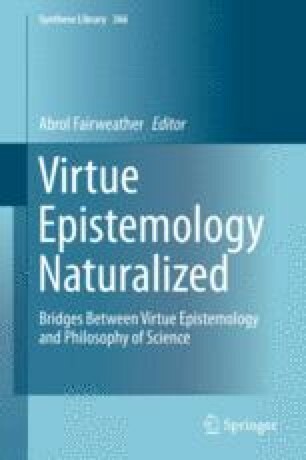 Although my special focus here will be the manifestation of this virtue of scientific character in experimental/observational praxis, I will show how this virtue functions in both experimental and theoretical contexts, and is in fact critical to the excellent function of each as a guide and constraint for the other. While there is no English term that captures precisely the meaning of the virtue I shall emphasize, the nearest approximation would be perceptual responsiveness. The virtue of being perceptually responsive is conceptually complex, and will require precise definition and clarification. Darwin, Charles. 1903. More letters of Charles Darwin: A record of his work in a series of Hitherto unpublished letters, Part One, ed. Francis Darwin and A.C. Seward. Accessed 1 Feb 2012 from Project Gutenberg at http://www.gutenberg.org/ebooks/2739.